We've studied the University Avenue Pedestrian Overcrossing in Berkeley back in February of 2009. It is one of several handsome bridges in the area that were designed by Mark Ketchum. Sadly, he died of cancer in February at the age of 60. There is a nice memorial to him on the internet. I remember his long hair (unusual for an engineer), for a letter he wrote in a journal challenging a mathematician's assertion that the Tacoma Narrows Bridge collapsed due to motion best described by chaos theory, and how he welcomed TY Lin to share his office after Lin departed from the company that carried his name. His bridges (like the nearby Carquinez Strait Bridge) are notable for their clean, elegant design. 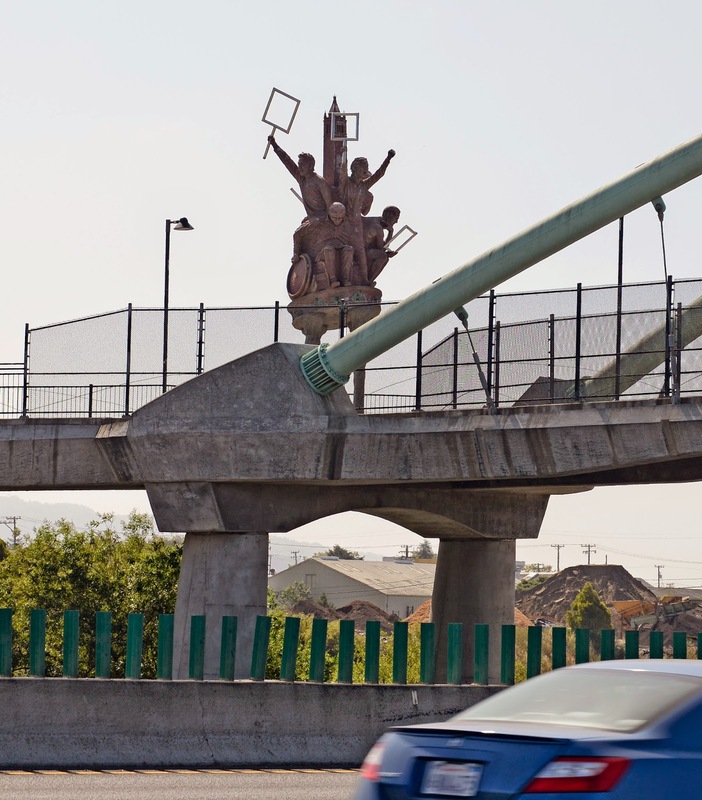 On his pedestrian bridge in Berkeley, the city mounted a 30 ft tall fiberglass sculpture on the east end showing events in the turbulent history of the university. A sculpture on the west end shows students interacting with dogs, birds, etc. Mark received his PhD from Berkeley and was a lifelong resident so he may have been pleased with the sculptures, but to my eye they detract from the bridge's appearance. Alameda County, California Bridges: University Avenue Pedestrian Overcrossing over I-80 by Mark Yashinsky is licensed under a Creative Commons Attribution-NonCommercial-NoDerivatives 4.0 International License.